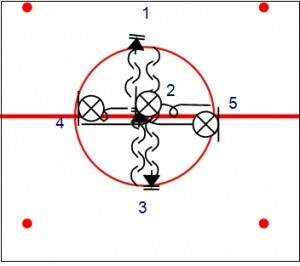 Weiss Tech Hockey now has goalie drills (scroll down for a sample)!! I’ll be honest with you… I don’t have a clue when it comes to training goalies! I can tell them a few basic things that are going wrong, or what openings I’m seeing as a shooter, but I generally have no idea how to get them to FIX it. This has been a bit of a dilemma for me on the blog… seeing as how many of you have requested I make a section on GOALIE DRILLS over the past couple of years. Well… the waiting is over! I would like to introduce you to Mr. Dennis Hands. Dennis is a great hockey guy, who has the same passion for the game as I do, but with some fabulous expertise in the goalie department. Over the past 5 years, Dennis has had the opportunity to learn from a number of NHL-caliber coaches such as Mike Babcock, Craig Johnson, and Predators’ goalie coach Mitch Korn. Needless to say, he brings a welcomed element of goalie knowledge to the table! Dennis brings over 30 years of hockey experience to the team, including 2 years starting goaltender for Jackson Lumen Christi Catholic High School where he led the team to the State quarterfinals and ended his high school career earning 1st team All-State and being invited and playing in the Michigan High School All-Class All Star game. He had a brief stint in the North American Junior Hockey League before moving on to play Division 1 College Club Hockey. Dennis spent 1 year at University of Michigan-Dearborn and 3 years at University of Arizona playing where he was the starting goalie all 2 1/2 years. During his career at U of A he led the team to a 77-19-1 record as well as 3 appearances in the ACHA National Tournament. Dennis won 2 top Goaltender awards during his career at U of A and in 2004 was inducted in the University of Arizona Icecats Hall of Fame. Dennis has spent the last five years in volunteer coaching rolls within the Jr. Ducks program. He has a certificate in Hockey team management and scouting through the well known Sports Management Worldwide and is a Level III certified coach through USA Hockey. Dennis has had a successful 12 year business career including roles as software implementation consultant, software sales manager, V.P. of Software Sales and most recently CEO of a Software Sales and Consulting organization. Dennis holds a bachelor’s degree in accounting and currently resides in Southern California with his wife Kristen and two children, Capriana and Carter.